India’s ace shooter Tejaswini Sawant has clinched the gold medal at the Gold Coast Commonwealth Games as she topped the 50m Rifle 3 positions event with a Games record score of 457.9. Her compatriot, Anjum Moudgil, settled for a silver medal after finishing second with a score of 455.7. 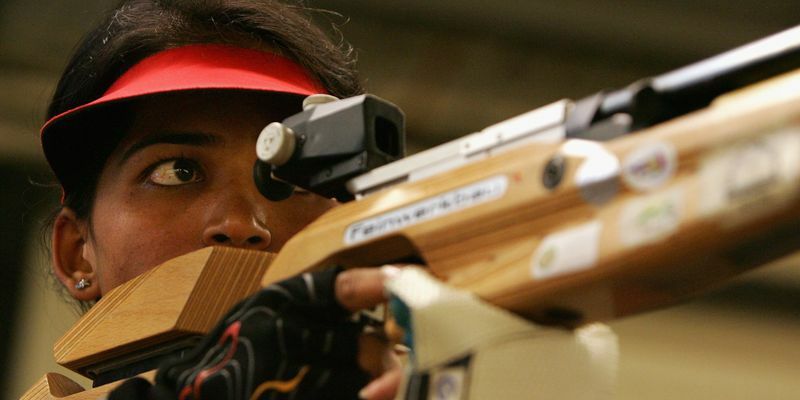 After clinching the silver medal in the Women’s 50m Rifle Prone event yesterday, 37-year-old Sawant has extended her excellent form by going a step further in the 50m Rifle 3 positions on Friday. After failing to start well in the previous event, Sawant ensured that she had the lead from the very beginning this time around. She scored 152.4 in the Kneeling event and 310.1 in the Prone, which was miles better as compared to the other seven shooters in the final event. The closest to her was compatriot Moudgil, who had shot 151.9 and 308.0 respectively in the events. Sawant had to do extremely well to catch up with the lead in the last game and she was constantly aware of it for this event, as she kept her elimination stage scores constant with them reading 407.3, 417.4, 427.4, 437.4, 447.4 and in the end 457.9. Her herculean effort even helped her create a Commonwealth Games record. Moudgil, though trailing Sawant, ensured that she stayed above the rest in the elimination stage as she never let her scores drop beyond 9 in the elimination stages. She ended her campaign with a score of 455.7 and consequently, won the silver. India now have 15 gold medals and 8 silver medals in their bag in Gold Coast and with the wrestlers still in contention, that tally is expected to rise over the next 4-5 hours. You can follow all the live action here.